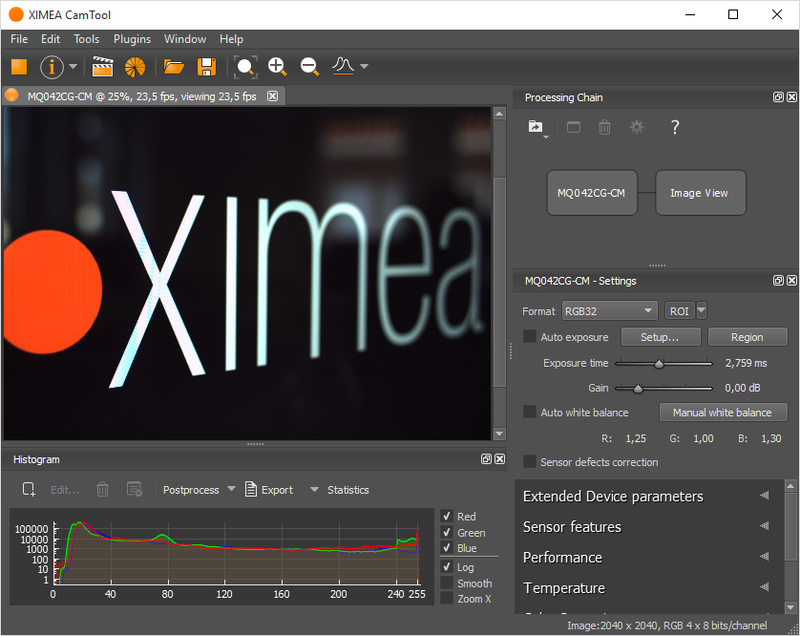 XIMEA CamTool is a cross-platform application showcasing the features and quality of all XIMEA camera families. It runs on Windows, Linux, macOS systems offering a substantial imaging tool set, which can be further extended with custom modules using a plugin infrastructure. Plugin structure of the utility allows to add more and more features continuously. xiB* and xiT cameras have additional lens control function for the EF-mount: aperture and focus. The aperture can be set directly by selecting the respective F-value using the aperture slider. The focus requires as movement value for the stepper motor to be defined first. Positive numbers will direct the movement to infinity. Negative numbers will direct the movement to macro. Then the specified move can be applied with the “Focus Move” button. CamTool saves each camera’s parameters and most user interface settings when the program is closed. The saved values are restored on the next start. By default the camera uses an automatic bandwidth calculation which measures the available interface bandwidth when the device is started. After the measurement a bandwidth limit is set using a 10-20% (depends on the camera model) safety margin. We test the playback of recorded data using the CamTool and standard formats also with VLC. Other decoders might work, but XIMEA does not guarantee the full functionality in all camera modes. Store speed is determined by the availability of CPU resources and speed of target drive. If you want to create a higher frame rate record, you can use the LoopRecord function that stores the image data first into the computer RAM. Later the result can be stored to other media and/or compressed by CPU. It is possible to implement a custom plugin for the XIMEA CamTool. More information can be found here.